The beautiful design of the universe, the solar system and our earth. The seasons. The equinox and summer and winter solstice. Go. The Magnetosphere, we can't live without it. Go. The critical Sun - Earth distance. Go. Some interesting trivia on the Moon Phase. Go. Have we been visited by Extraterrestrials? Go. Regarding date and time, an event in the early hours of the morning in Australia will be on the previous day for some countries, for instance in the UK and the USA. EAST = Eastern Australia Standard Time is 10 hours ahead of UT (Universal Time). Calculation: Every fifteen degrees East of 0 deg. (which runs through Grenwich in England) equals one hour. So the 150 deg. Longitude which runs through Eastern Australia is ten hours ahead of Grenwich (zero degrees). If you calculate West of Grenwich, then one hour is subtracted for every fifteen degrees. NB: For reasons of convenience, some official time zones don't follow exactly the above neat rule. Equinox - The sun is over the Equator on or about 21 March and 22-23 September. September Equinox for 2016 is on 22 September at 1422 (2:22 pm) UT (23 September @ 00:22 or 00:22 am EAST). During an Equinox, the sun rises directly in the east and sets directly in the west (give or take about one degree). Try this. Early in the morning of the Equinox, drive a stake into the ground. Where the shadow from the tip of the stake meets the ground, place a marker. Continue to place a marker on the ground every hour. At the end of the day, join all of the markers. You should have a fairly straight line (except for those in the extreme latitudes north or south) in a direct east - west direction. December Solstice - The sun is over the Tropic of Capricorn (23.5 degrees south) on or about 21-22 December. All of the area inside of the Arctic Circle is in darkness while all of the area inside the Antartic Circle (in the southern hemisphere) is in sunlight. This is the summer solstice for the southern hemisphere. 2016 Sun will be over the Tropic of Capricorn on 21 December 2016 @ 1045 (10:45am) UT (21 Dec. @ 2045 (8:45 pm) EAST). 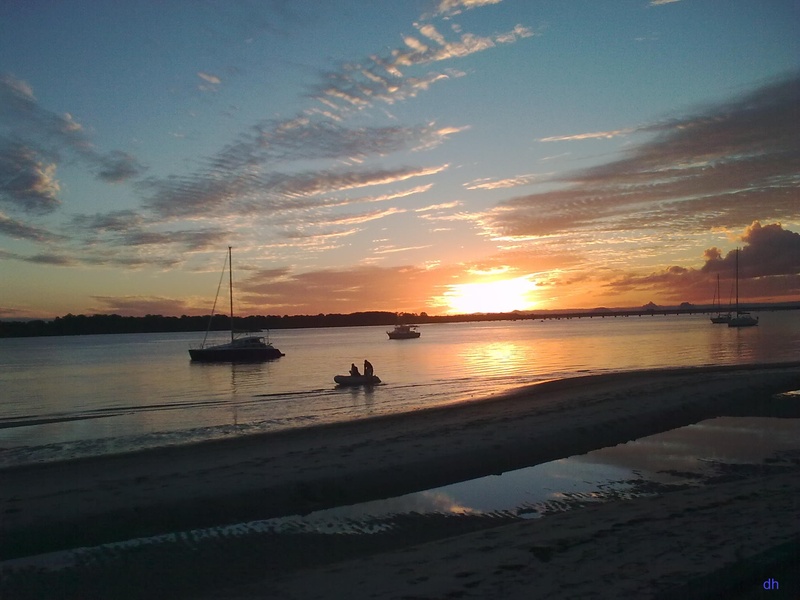 Can you see why north Queensland is opposed to daylight saving from the photo of the globe above and below? When the sun rises over Brisbane (above photo), Cairns in the far north and slightly to the West is still in darkness. June Solstice 2016 - The sun is over the Tropic of Cancer (23.5 degrees north) on 20 June 2016 @ 2235 UT (10:35 pm). (21 June @ 0835 (08:35 am) EAST). This is the Winter Solstice for the Southern Hemisphere. Why Is July Colder Than June - In The Southern Hemisphere? In the southern hemisphere, June receives the least amount of daylight hours. 21 June (give or take a day or two) is the shortest day of the year. So why is the following month the coldest? Answer: As the sun begins to move south from the tropic of Cancer, the southern region of the earth continues to loose heat into the atmosphere from the ground and the oceans. It is not until August that the heat gain from the sun is greater than the heat loss, consequently, July is the coldest month of the year, even though June has the shortest day. The same situation applies to summer. January is hotter than December because the southern hemisphere continues to gain heat in the first few weeks that the sun moves north from the tropic of Capricorn. In the northern hemisphere, January is colder than December and July is hotter than June for the same reason. God gave the earth its 23 1/2 degree tilt (23 degrees 26 minutes and 21 seconds of angle to be exact) so that different regions of the earth would receive the warmth of the sun. Otherwise the Equatorial region of the earth would become much hoter and the polar regions much colder, leaving a very narrow temperate region. The earth moves on an eliptical path (not a perfect circle) around the sun. In January, the earth is 147.1 million klm (91.4 million miles) from the sun. In July it is a further 5 million Klm distant at 152.1 million klm (94.5 million miles) (World Book Encyclopedia, Vol. 6, p. 17). The slight variation in distance is not significant regarding the solar heating of the earth. The axial tilt has a far greater effect. 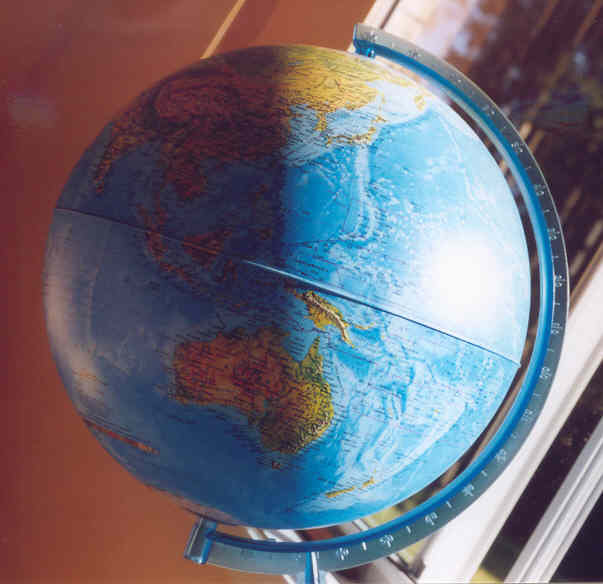 When the southern hemisphere is tilted toward the sun, the amount of sunlight hours increases the further south you move. For instance, on 15 December at 10 deg. south latitude, sunlight = 12 hours 42 minutes. At 40 deg. south, sunlight = 15 hours. Consequently, Tasmanians love daylight saving, whereas it is resisted in north Queensland. Daylight hours at the Equator = 12 hours 7 minutes all year round (Daylight hours data from Seasons, Encarta Encyclopedia). When the sun is over the Tropic of Capricorn, daylight hours south of 66.5 degrees (Antarctic circle) are 24 hours. A problem for those wanting daylight saving in Queensland Australia is that on 01 January for example, the sun will rise at 4:56 am in Brisbane, but will not rise in the city of Cairns (in the far north and slightly to the west) until 5:47. That means that in effect, Cairns, and towns in the far west are already practicing daylight saving. (Sunrise times from The Courier Mail, 02 October 2007, p. 2). The moon does more than give us some light at night. It also acts to stabalise the earth on its correct tilt. The earth has a hot molten iron core whose movement is believed by many to be the cause for the generation of a magnetic field (the magnetosphere) around the earth. The magnetic field holds the atmosphere onto the earth. Without the magnetic field, the atmosphere would be stripped away from the earth by the solar wind - a plasma of charged particles (electrons and protons). The magnetosphere which is compressed by the solar wind extends out to about 65,000 klm on the day side of the earth. This shield, in addition to providing protection for the atmosphere, also provides protection from very harmful radiation. The moon by contrast does not have a hot liquid iron core nor a magnetosphere. Sunlight diminishes at the rate of the square of the distance from the sun. The Earth is situated approximately 150 million kilometres from the sun, so how much light will a planet receive if it is situated at twice that distance? The answer is one quarter. For a planet at four times the distance, it will receive one sixteenth. This can be proved mathematically. Lets say one square metre (or one square yard) of cloth spread out facing the sun at the Earth distance receives light valued at 16,000 units. We will now calculate the surface area of a sphere which has a radius of 150 million kilometres - the distance of the Earth from the Sun. The reason for this calculation will become apparent shortly. Surface area calculation = 4 pi R (radius) squared (4 x 3.14159265 x 150 squared) = 282,743.33 million square kilometres. 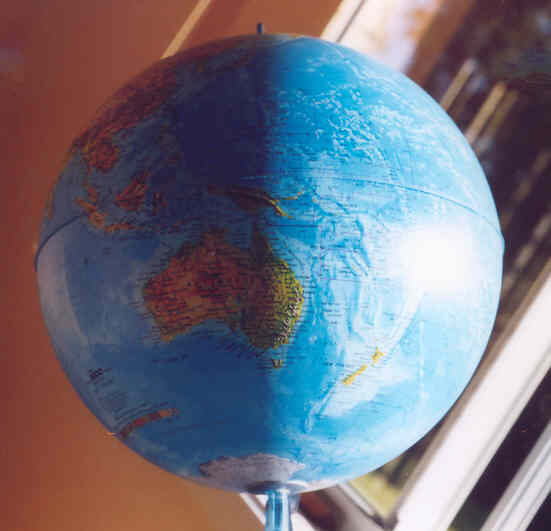 The surface area of a sphere with a radius of 300 million kilometres (twice the Sun Earth distance). Calculation (4 x 3.14159265 x 300 squared) = 1,130,973.35 million square kilometres. How much greater is the surface of the larger sphere? Light is not lost on its way out to the larger sphere, it is simply spread more thinly. The same amount of light is spread out over four times the area. Now one more calculation. 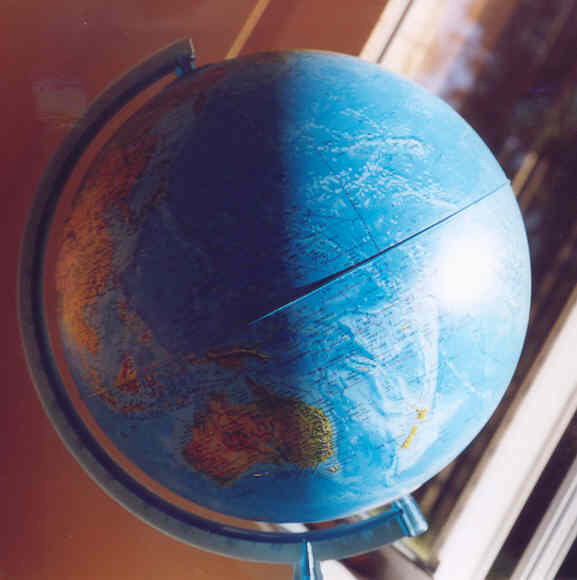 A sphere with a radius of 300 million kilometres, four times the Sun - Earth distance. Calculation (4 x 3.14159265 x 600 squared) = 4,523,893.42 million square killometres. Comparison to sphere of Sun - Earth distance. This shows that a one square metre of cloth receiving sunlight rated at 16,000 units when spread out on earth, would receive light at just 1,000 units when spread out on a planet at four times the distance from the sun. All of the planets beyond Mars are more than four times the mean Sun - Earth distance (AU, Astronomical Unit). The distance to Jupiter is 5.204 (AU scale). At that distance, the strength of sunlight hitting our one square metre of cloth is reduced to just 3.69% of what it receives at the Earth distance (one AU). The distance to Pluto is more than 39 AU. No wonder it's cold on Pluto! The beautiful design of the solar system points to a wise and powerful creator. "In the beginning God created the heavens and the earth." (Genesis 1:1). Now for some interesting trivia on the Moon phase which is 29.53058 days long. The gestation period (length of pregnancy) for humans is approximately 266 to 270 days. More broadly, in the range of 260 - 280 days. Gestation period in calendar months = 266 days divided by 30.4375 = 8.74 calendar months. This period is not quite nine calendar months, whereas in lunar months, it is exactly nine months. 266/29.53058 = 9.007 Lunar months. This means that for the average pregnancy, the moon phase on which a person was born is the same phase on which he or she was conceived. So, for instance, if a person was born on the first quarter of a moon phase, and the pregnancy was of normal duration, then the baby was conceived on the first quarter of the moon phase. The Encyclopaedia Brittanica reports that the gestation period for a male is longer by three or four days than for a female. Some people believe our planet has been visited by Aliens (extraterrestrials). Up until the 1960s, the predominant thought regarding the home of these extraterrestrials was that they came from somewhere in our solar system. A favourite was Mars. The term �Martians� was used of the people who supposedly inhabited the planet. In the 1960s there was a comedy TV programme titled �My Favourite Martian�. Before Jupiter was found to be composed of gas, some imagined it had people. Ellen G White (1827-1915), who is generally believed by those in Seventh Day Adventism to have been a prophet, held to the idea that Jupiter had tall majestic people. It was Ellen White who urged her followers to abandon the Christian Sunday Sabbath in favour of the Jewish Saturday Sabbath. Our knowledge of the solar system has greatly improved since her time. The nearest star to our Sun is Proxima Centauri, a very faint dwarf star - actually too faint to be seen without the aid of a telescope. This star is part of the Alpha Centauri triple-star system. Alpha Centauri is the outer star of the two pointers which point to the top of the Southern Cross (Crux) constellation. Unfortunately for those in the Northern Hemisphere, it is not visible north of the region of the tropic of Cancer. Proxima Centauri is situated more than four light years away (Coordinates 14h 29' 42.94", Declination - 62� 40' 46.14"). Light travels at just under 300,000 kilometres per second (299,792.458 kps). According to Einstein�s Theory of Relativity, it is impossible for a spacecraft to exceed the speed of light. The theory predicts that the spacecraft would dramatically increase in weight as it approached the speed of light until it weighed as much as the entire universe, which of course is impossible, hence, it is impossible for a spacecraft to exceed the speed of light. This gives an absolute minimum travel time of just over four years from Proxima Centauri to Earth. If we gave our imaginary spacecraft a very generous velocity of 150,000 kilometres per second, it would take in excess of eight years to travel from a Proxima Centauri planet to earth. At least 99% of the journey would be in pitch black conditions at near absolute zero temperature. When I go on a long journey in my car, I plan to stay at my destination for at least the length of time it took me to get there, particularly if there is little scenery on the trip. An ET planning a sixteen year trip to earth and back would need to consider a sixteen year stay on Earth to make the long arduous journey worthwhile. There is no clear evidence of an ET spacecraft spending even a small amount of time on earth. We must also consider the possibility that Proxima Centauri does not have a planet which is capable of sustaining intelligent life. In that case, the ET would need to face an even longer journey from the region of a different star. In addition to the severe psychological strain of travelling through black dull space for many years, there is the additional problem of radiation. Even for a comparatively short trip to Mars, this is a big problem. Galactic Cosmic Radiation (GCR) which comes from exploding stars and the environs of black holes impart a lot of energy when they impact the human body. Among other things, they damage DNA, and are the most difficult form of radiation to protect against. For people on earth, we have protection by means of the magnetic field, the atmosphere, and the solid earth. The magnetic field gives astronauts circling the earth protection out to about 65,000 kilometres. An article on the BBC web site makes the point, "...for astronauts in deep space even an aluminium hull 30cm thick is not going to change their exposure to GCRs very much." It has been calculated that an astronaut travelling to and from Mars at the current maximum velocity would receive 660mSv (660 milli sieverts) of radiation. That's not counting the radiation received while on the planet. Space agencies try to keep their astronauts from reaching 1,000mSv over their careers. That level is associated with a 5% increased in the risk of developing a fatal cancer. 1,000mSv is likely to bring neurological impairment and eyesight damage. The annual average for people living in the UK is 2.7mSv from all sources. For comparison, six months on the space station will give an astronaut 100mSv, and six months in deep space will give 320mSv. The rover on mars took 253 days to cover the 560 million kilometres in 2011/2012. The average speed was 92,226 kph. (57,319 mph). For more information, go to http://www.bbc.co.uk/news/science-environment-22718672. "... at high altitudes, the magnetic field is significantly distorted by the solar wind and its solar magnetic field. On the dayside of the Earth, the magnetic field is significantly compressed by the solar wind to a distance of approximately 65,000 kilometers (40,000 mi). (https://en.wikipedia.org/wiki/Magnetosphere). From the 2007 Recommendations of the International Commission of Radiological Protection we learn that "One sievert carries with it a 5.5% chance of eventually developing cancer. Doses greater than 1 sievert received over a short time period are likely to cause radiation poisoning, possibly leading to death within weeks." (https://en.wikipedia.org/wiki/Sievert). Missions to the Moon, Mars and to the orbiting space lab, along with other missions have produced a large amount of space junk. Much of the junk is orbiting the earth at high velocity. Because of the danger it presents to space missions, it is carefully monitored with the aid of special computer software. Over the many decades of interest in alien spacecraft, there has not been any clear evidence of junk being left behind by alien craft, either in space, or on the ground. There was some interest in alleged photographic evidence of short alien men who were believed to have crashed their craft in a remote region of the US. However, the evidence was found to have been manufactured. It was an elaborate hoax. George Adamski (1891-1965) from California USA, had a very keen interest in UFOs. On 20 November 1952, he drove out to a quiet place in Arizona with the aim of finding UFOs. He was rewarded with the sight of a craft landing in the hills before him. An alien visitor approached and they communicated telepathically about various things. The visitor specifically indicated that he came from Venus (Marvels and Mysteries: Aliens, The Book Company, 1996, p. 70). A problem with this claim is that Venus is very hot at 460 degrees Celsius - hot enough to melt led. The heavy atmosphere is 96.5% Carbon dioxide. Obviously, George Adamski did not know about the hot temperature of Venus when he gave his report back in 1952. A difficulty in trying to obtain a solid picture of who the people are who are trying to contact us comes from the fact that sightings of aliens give a confusing variety of shapes and sizes. Some wear spacesuits. Some even come in the form of ape like animals, including one-eyed creatures. A few aliens even travel through walls. People who report being lured into a spacecraft and laid out on a table and medically examined also report that they were in a semi-conscious state at the time. When they come to full consciousness, they have a belief that they were abducted and can vaguely remember key points of their experience. One UFO and abduction reporter makes the point that American Indian medicine men regularly underwent experiences similar to UFO abduction reports. These men were actually mediums for evil spirits. A conformation of occult connections to UFOs comes from two UFO investigators. One discovered his investigations were moving in the direction of the occult, so he decided to burn the material he had gathered. He noticed the fire was unusually hot and he saw a strange figure in the flames. He warned his UFO investigator friend about his experience and urged him not to destroy the information he had gathered by fire. It was some time later that his friend decided to destroy his material. His friend reports �... when it came to my collection of slides, I stupidly threw them in the living room fire. Immediately there were loud cracks like explosions, and the heat was fantastic. I thought the chimney breast was going to split. It was a terrible experience, and I�m convinced the slides were satanically blessed.� (Aliens, p. 29). My comment on the above is that both men did the right thing; Satanic (Occultic) material should be completely destroyed, preferably by fire, however, protection from evil forces should be sought through prayer as they will be annoyed that material promoting their ideas is being destroyed. In summary, we should dismiss the idea of alien craft paying visits to our Earth. We also need to be mindful of the dark forces which are hostile to the proclamation of Jesus Christ. Some fear many things which will not happen, including attacks from alien beings. The Lord our God gives comfort to his people, he says, �So do not fear, for I am with you; do not be dismayed, for I am your God. I will strengthen you and help you; I will uphold you with my righteous right hand.� (Isaiah 41:10). Gary Bates, �Alien Intrusion� This book is highly regarded. See www.creation.com for details. "Marvels and Mysteries: Aliens", The Book Company, 1996. Large fromat, approx A4 size, 112 pages. Proxima Centauri is a dwarf star 20,000 times fainter than the sun, it can not be seen with the naked eye. It has a brightness level of magnitude (apparent magnitude) of 11.0. Absolute magnitude = 15.45. Stars with an apparent magnitude number greater than 6 are not visible to the naked eye. Ground based telescopes can see very faint stars out to a magnitude (apparent) of about 30. The brightest star in the night sky when viewed from earth is Sirius with a magnitude of - 1.44. Greek astronomers graded the brightness of stars between one and six. A magnitude of one given to the brightest stars and six to the stars barely visible to the naked eye. With the aid of accurate instruments to measure stellar brightness, the Greek scale has been refined. It has been decided that 100 stars of magnitude 6 should equal one star of magnitude one. This means the level of brightness between one magnitude and the next is the fifth root of 100, which is 2.512 (rounded up). This means the differences of 2.5, 5 and 10 magnitudes correspond to brightness ratios of 10, 100 and 10,000 respectively (Magnitude, Philips Astronomy Dictionary, p. 122). The refined scale has resulted in four of the brightest stars having values with negative numbers. Arcturus is a variable star, consequently, on some star charts, it is not listed with a negative number. The numbers in brackets give the position of the star. A declination with a negative number indicates the star is positioned in the southern hemisphere, e.g. Dec - 16° 43' (16 degrees and 43 archminutes south of the celestial equator). Of all the stars in the northern hemisphere, Arcturus is the brightest (apparent magnitude). Arcturus - 0.05v (14 h 16' x 19° 11'). There are two magnitude scales. The scale used by a person locating the bright stars in the night sky is the apparent magnitude. The scale which rates the actual brightness of a star, that is, the amount of light which the star actually give out, is called the absolute magnitude. By way of example, see listed some stars with apparent magnitude given first, followed by absolute magnitude. Note that while Sirius is the brightest star in the night sky to the unaided human eye. The star which give out the most light in the night sky in the list below is Canopus. Sirius: Apparent = -1.44. Absolute = 1.45. Ross 154: Apparent = 10.37. Absolute = 13.00. Canopus Apparent = - 0.26. Absolute = - 5.53. The absolute brightness of the double star system of Rigil Kentaurus at 4.07c is just marginally greater than that of our Sun at 4.82. Uploaded on 01 August 2012. Expansion on 01 September 2012. AU (Astronomical Unit) mean Sun - Earth distance = 149,597,870 Klm. (92,955,807 miles). Disclaimer: While reasonable care has been exercised in presenting the above information, the author does not warrant that it is free from errors. The information is provided "as is". Suitable commercially available data should be sought where the information is important.